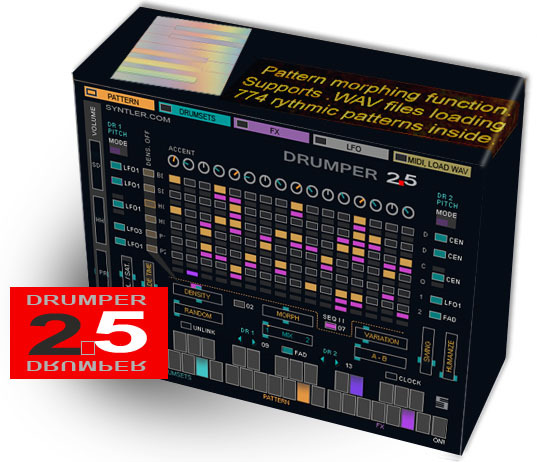 DRUMPER has two internal sequencers and creates a rhythmic pattern by morphing between them. This rhythmic pattern simultaneously plays two drumsets, the sound of which can be processed and mixed in different ways. 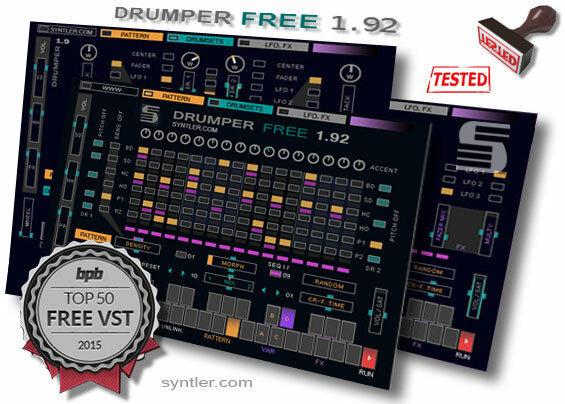 DRUMPER is compatible with any standard MIDI keyboard or controller and operates in real-time. 1) Improved FX processor. Now you can edit effect parameters for each of seven FX-keys for each preset. 2) Added two drumsets for downloadable wav files. Now drumsets 17 and 19 are Program Change sensitive. Now you can use different samples for each preset. 3) Swing parameter (0 - 100%). 4) Humanize parameter. This makes the "uneven play". 5) Added one more LFO oscillator. 6) Changed filters unit. Now you have 2 filters for each drumset combination. 7) Now patterns 1-6 are Program Change sensitive. Thus, it is possible to program up to 774 different patterns for one song (6*128+6). 9) Changed RANDOM function. Randomization can be added in percentage now. 10) New SEQ LOOP function which allows you to repeat a short (1 to 8 steps) fragment of the sequence. 11) New ORDER function. Now you can play pattern steps in different order. For example, in the reverse direction. 11) Fixed DENSITY unit bug. Now it works correctly. 12) Fixed VOLUME control bug (for downloadable samples). 32-bit VST-2 instrument for Windows O.S. 20 drumsets including bass drum, snare drum, close and open hi hat, 2 percussion samples. Supports loading of .WAV sample files (20 samples for 2 drumsets, 16, 24 bit). 12 editable pattern combinations for each preset. 4 LFO with syncronization and "sample and hold" shape. 2 filters with resonance and frequency control for each drumset combination. Pan, pitch, decay and reverb control for each drum sound. FX processor with repeat effect, stereo delay and stereo fazer. MIDI "learn" function for all faders and knobs. Free update for DRUMPER 2.3 users. The Oldigy-t (track) is a low bit analog to digital converter that emulates the sound of old samplers and computers. Free. 32-bit VST-2 plug-in for Windows O.S. Mono. Linear pulse-code modulation (LPCM) and Nonuniform PCM. Emulation 4 - 12 bit sound. 12 drumsets including bass drum, snare drum, close and open hi hat, 2 percussion samples. 12 editable pattern combinations including 4 rytmic variations for each combination. 3 LFO with syncronization and "sample and hold" shape. 2 filters with resonance and frequency control. FX processor with repeat effect, delay and fazer. Download the plugin is free. The program was tested in vsthost-1-54-32 and in cubase 5 under Windows 8.1. Post your comments (english and russian) here. 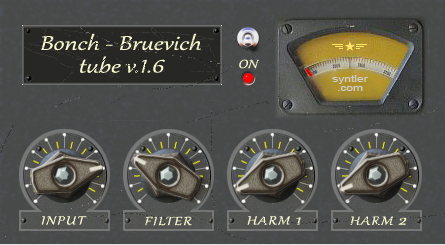 Bonch - Bruevich tube is a tube exciter. Use it to add higher harmonics to the incoming signal. It makes the sound more detailed. Good for guitars, vocals and synths. Put the file bbtube1-6.dll in the folder with your VST instruments. VSTi Groove, fx and arpeggio synth. Tempo quantize. (16, 32, off). Now the joystick works when the groove mode enabled. 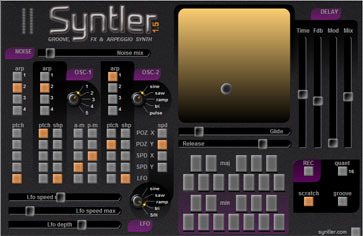 Put syntler.dll in a folder with your VST instruments. Open as VSTi in the project. Move the joystik and play the virtual keybord or MIDI. MIDI keys 36 - 47. Key velosity (0 - 63) - minor, (64 - 127) - major. For scratch and fx play, press the "scratch" button. For groove play, press the "groove" button, then click "REC" and move the joystik (after 1 bar light metronom).